How Is Silicone Used in Breast Implants? Silicone is a polymer that has a wide range of uses in personal care products and surgical implants. It can be found in liquid, gel, or rubber-like solid forms. Learn about its advantages and its use in breast implants. Silicone appears in approximately half of all makeup, hair, skin, and underarm products. The gel form of silicone is used in bandages and dressings and breast, testicle, and pectoral implants. Silicone is widely used during ophthalmic procedures. It has been used to replace vitreous fluid after a vitrectomy, serve as intraocular lenses during a cataract procedure, as punctal plugs for dry eye surgery, and in treatment for retinal detachment. The most well-known use of silicone is as breast implants for breast surgery. Breast implants are medical devices implanted under the breast tissue or muscle of the chest to either increase breast size or help reconstruct the breast. Breast implants are either saline-filled or silicone gel-filled. Both types of implants have a silicone outer shell. 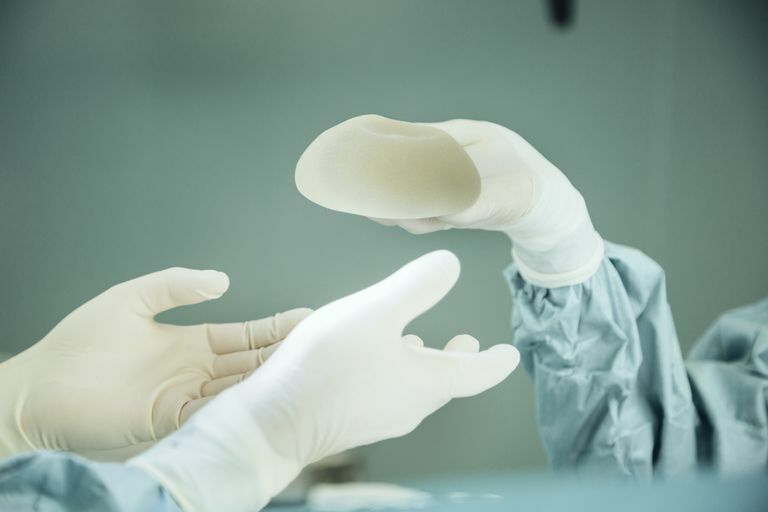 For patients with silicone gel-filled breast implants, it is recommended that they obtain an MRI screening for silent rupture three years after implantation and every two years afterward. A silent rupture is the leakage of silicone from the implant into the tissue that forms around the implant. A ruptured silicone breast implant can cause breast pain or changes in the shape of the breast. To correct some of these complications, additional surgery may be required. The FDA notes that breast implants are not meant to last a lifetime, and the longer you have them, the more likely it is that you will need surgery to remove or replace them. The FDA issued a safety update in 2011 and said silicone gel breast implants are reasonably safe when used as labeled. They say there is, "no apparent association between silicone gel-filled breast implants and connective tissue disease, breast cancer, or reproductive problems." But they note that they need larger and longer studies to rule these out. Systematic reviews of the safety of silicone breast implants show that there are few randomized controlled trials (RCT) that are of good quality to assess. This is despite the huge numbers of women who get silicone breast implants either for breast reconstruction or for breast augmentation. One 2016 review published in the Annals of Internal Medicine concluded, "The evidence remains inconclusive about any association between silicone gel implants and long-term health outcomes. Better evidence is needed from existing large studies, which can be reanalyzed to clarify the strength of associations between silicone gel implants and health outcomes." The Cochrane Database of Systematic Reviews review of whether there was a difference in outcomes between saline-filled and silicone-filled breast implants for breast reconstruction likewise found they didn't have enough evidence to draw conclusions or for surgeons to properly advise women about which was best, "Despite the central role of breast reconstruction in women with breast cancer, the best implants to use in reconstructive surgery have been studied rarely in the context of RCTs. Furthermore, the quality of these studies and the overall evidence they provide is largely unsatisfactory." Balk EM, Earley A, Avendano EA, Raman G. Long-Term Health Outcomes in Women With Silicone Gel Breast Implants. Annals of Internal Medicine. 2015;164(3):164. doi:10.7326/m15-1169. FDA Update on the Safety of Silicone Gel-Filled Breast Implants. June 2011. Center for Devices and Radiological Health U.S. Food and Drug Administration. Rocco N, Rispoli C, Moja L, et al. Different types of implants for reconstructive breast surgery. Cochrane Database of Systematic Reviews. 2016. doi:10.1002/14651858.cd010895.pub2. Silicone Gel-Filled Breast Implants. FDA. https://www.fda.gov/MedicalDevices/ProductsandMedicalProcedures/ImplantsandProsthetics/BreastImplants/ucm063871.htm.